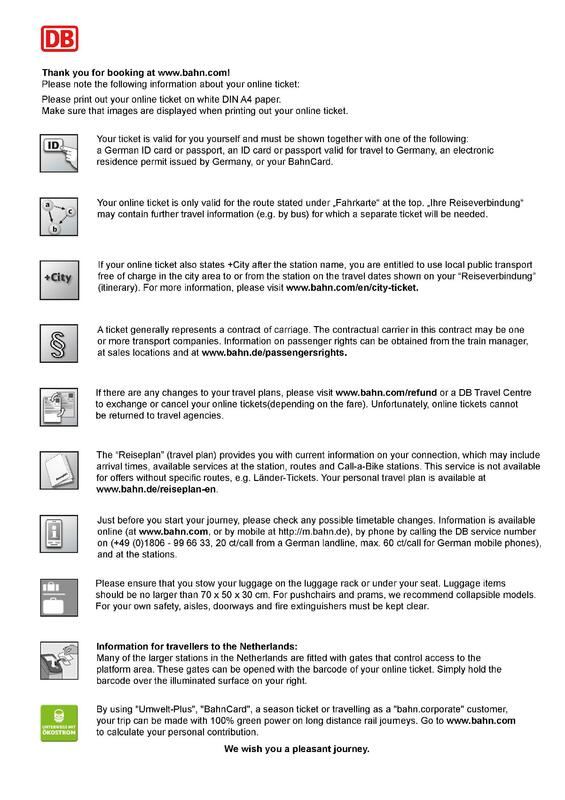 Following is a translation of your Deutsche Bahn ticket as well as more information about German train tickets. Because these tickets are issued by the German rail operator, they are only issued in German. We've created a guide in English to help you understand your tickets and key terms. Is my ticket for all passengers? Yes, but only the lead passenger's name is shown on German train tickets. All other passenger names are contained in the QR code which the ticket inspector will scan. Erwachsener means adult in German. On mobile tickets, this is abbreviated as "Erw". 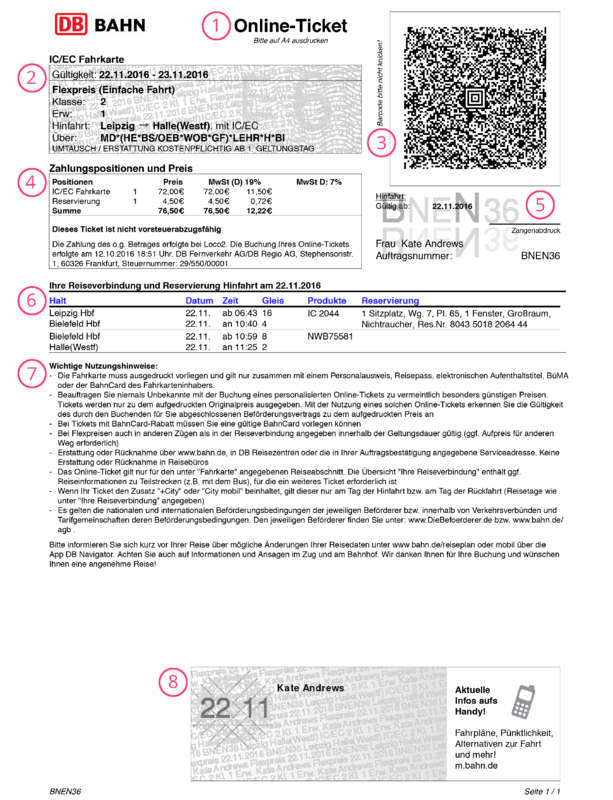 Tickets from Deutsche Bahn, the German rail operator, contain key information in German. Each number corresponds to a note, which contains helpful information to help you understand your ticket. Some tickets don't look exactly like our translated examples, but should be very similar. Here’s the same DB ticket translated into English. "Please print your ticket on plain A4 paper". Train and fare info, including type of train (i.e., IC [InterCity]), travel class, fare type, number of passengers and validity dates. "Please do not bend the bar code". Payment summary: includes product price, seat reservation cost (if applicable) and VAT. The validity of your ticket (usually one month) and the name of the passenger who must present ID. If you have purchased a seat reservation with your ticket, it may only be valid on the service specified in your “service and reservation details” section (see 6 below). Name of the passenger who must show identification with the ticket. This ID can be a passport, government-issued ID, or Bahn Card. This section also shows your Deutsche Bahn booking number. Service and reservation details. If you have purchased a reservation your ticket will be valid on the trains specified here. You will also find your coach (Wg) and seat (Pl) numbers for your train/s in this section. Some tickets, for example, "Normalpreis" tickets, have optional reservations so you may be permitted to travel on other services on the specified route. You should always refer to the specific fare conditions of your ticket. Information about the terms and conditions associated with using your ticket. Please note that for exchanges and refunds you should contact Loco2, who will process amendments/cancellations with Deutsche Bahn on your behalf. The ticket inspector will use this information to cross-reference your ticket with your ID card. 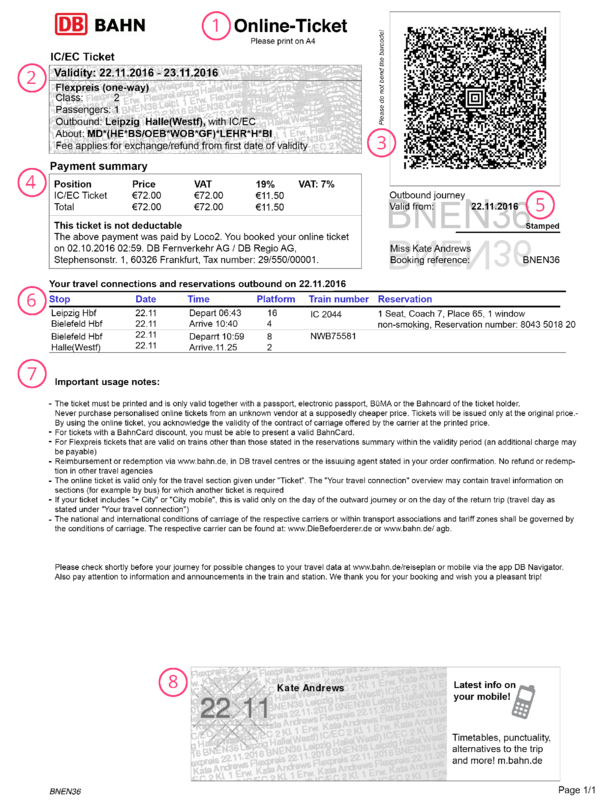 As of 1 October 2016, the passenger listed on the ticket must show a passport, government-issued ID or Bahn Card. 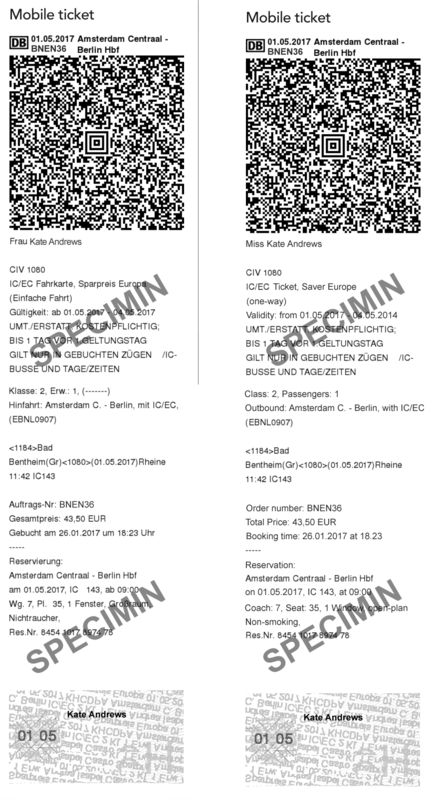 See Buying a German train ticket for somebody else if you are purchasing a ticket for someone else to travel on. Your mobile ticket will include all of the information above; simply scroll down below the scannable QR code. Your train, carriage and seat numbers are located at the bottom of the mobile ticket. Please see our Help article Using mobile tickets for more information. Bahn: usually refers to the railway, also means train. Zug: train. There are different types of train, e.g. Schnellzug, fast train and Nachtzug – night train.